This is the driving moral code for Microsoft’s enterprise web conferencing software, Lync, which is holding its second annual conference next week, February 18th through the 20th, in the lively and colorful Las Vegas. Connectedness and technology’s power to increase communication has been on the public’s mind, especially with the ever-present idea that technology hinders connection. Microsoft only enhances the debate. Despite their mission to increase connectedness through Lync, Microsoft is creating a divide. This year’s Lync conference is timely. Not only on a moral front, but in the wake of its recent integration with Skype. Microsoft owns both Skype and Lync, but Microsoft is striving to combine the narrower usership of Lync (5 million enterprise users) with Skype’s massive general usership of 300 million people. To enable greater reach with Lync — not just between colleagues and companies, but between employees and customers — Lync allows enterprises to contact those who use Skype. 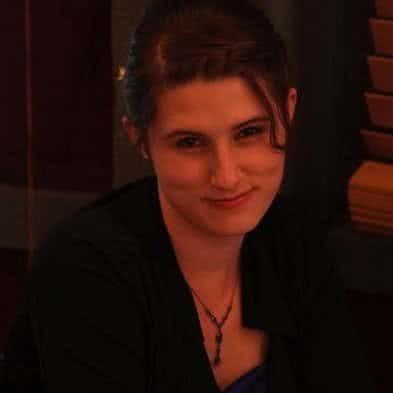 Lync and Skype’s initial integration was a necessary move in order to ensure web conferencing was available for non-Lync users, but perhaps an even larger hope was that the two solutions would merge: Lync could tap into Skype’s massive user base and bring more users to Lync. Unfortunately, Lync and Skype remain polar as the water and oil of web conferencing software. Some are avid users of Lync; others stick viciously to Skype, posting articles like “Why bother with Lync if Skype is free?” and “Microsoft should kill Lync rather than integrate it with Skype.” The two solutions have formed teams, many opposed to the integration and the threatening presence of Lync’s enterprise web conferencing platform. While the two solutions are “integrated,” the integration creates a divide between Lync users and Skype users. If you are leaning toward neutral, we’ve designed a handy quiz to help you figure out which team you most affiliate with. Those who are on Team Lync understand their solution is more professionally-oriented program. 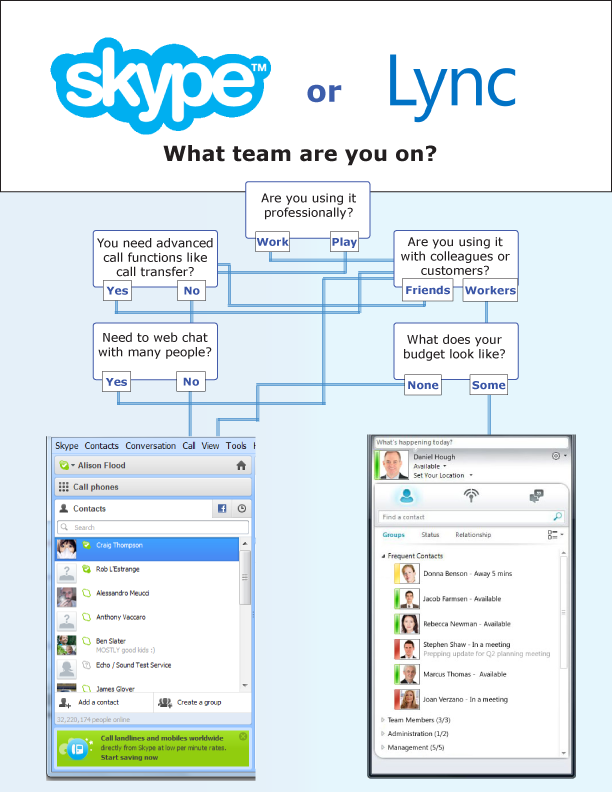 To them, using Lync over Skype is the equivalent of posting statuses on LinkedIn over Facebook. Lync allows managers and administrators to configure contacts, permission settings and groups. Also as an on-premise solution, Lync has more powerful security settings, making Lync an all-around more robust system. The web conferencing software can also be a makeshift helpdesk tool, calling upon the solution’s advanced features such as call transfer, call park, hunt groups and call pickup. Also, if your office uses Microsoft Outlook for email, your status will automatically change if you are busy in a conference. 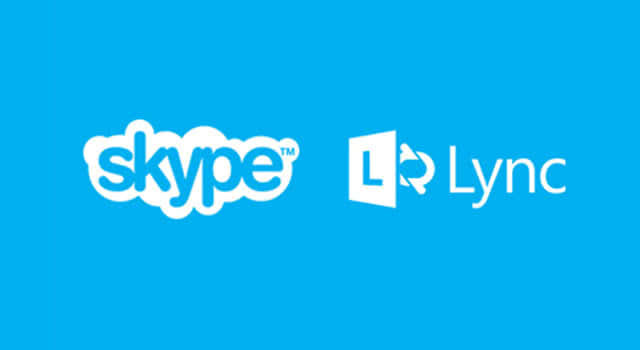 What does Lync mean for Skype users? While Lync is able to call Skype users, the divide between Lync and Skype is unlikely to change. They may both be Microsoft products, but Microsoft understands the two solutions appeal to different audiences. Microsoft is clear that Lync is integrated with Skype in order for professionals to communicate with customers and partners. Because Microsoft understands the practical difference between the two solutions, they may choose to further integration by providing more help desk tools, allowing Lync to employ more dynamic troubleshooting features. Whether you are on Team Lync or Team Skype, you can feel safe that the solution you love will not be tarnished by the other. 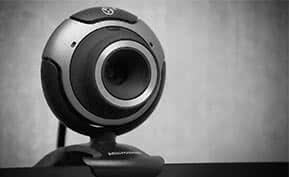 But if you wish to set out to prove us wrong, tune in to Lync Conference between the 18th and 20th. 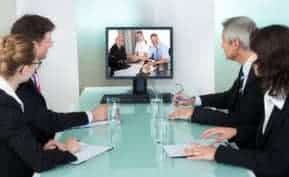 Want more on Web Conferencing Software? Discover and learn more about web conferencing software by exploring blog posts, whitepapers and more on our web conferencing resource page. 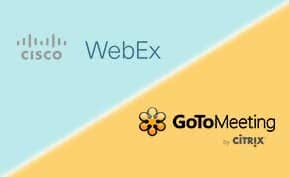 For comparisons of the best web conferencing software, download Business-Software.com’s Top 10 Web Conferencing Software report.